Devin spent his entire stretch off building the egg mobile, and I must say the hens love it. 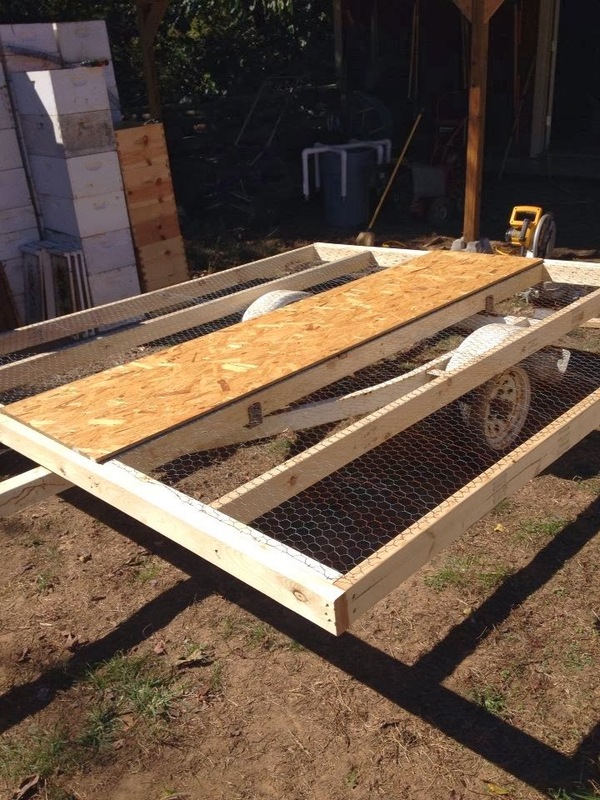 It started out as an old jet ski trailer we got for free. We put a solid board in the center but we left the sides covered with only chicken wire. The roosts will be above those areas and we want the poo to fall to the ground. We originally had wood on all four sides, but we decided tin would be lighter. We have tin on two sides and wood on the sides with doors. .We have a ramp door on one side that folds down so the birds can easily get in and out. The back side is a door that opens regular. I have two nest boxes hanging on it. We placed our large nesting boxes on one side, so the birds have many places for egg laying. Yes, this egg mobile is pulled around with our riding lawn mower. We do not own a tractor so we had to work with what we DO have, which is the lawn mower. Devin put a ball on the hitch area and the trailer hooks right up. So far we have moved the egg mobile to two spots with the hens inside and it all went very smoothly. This morning I moved the egg mobile to a spot the cows occupied a few days ago. It was loaded with cow patties. You can see above what the hens will do to a cow pile. Within an hour almost all of the patties were scratched up and spread out. The hens eat the bugs, larvae and spread the manure out so that it can fertilize the grass. This young pullet is one very content bird, and we are one step closer to a salad bar beef farm. Next I will paint the wooden areas of the egg mobile to help it hold up a bit longer in outdoor weather. and then we start looking into some fencing! Hi, I've been following your blog for a few months since I came across a link on KFC forum. I love to read about cows, bees and family. (I am a home birthing, attachment parenting, home-Eding, full time mum of 3 on a small farm in Ireland). Your egg mobile is great! My DH is always thinking about structures being able to withstand gale force winds so I find myself thinking the same way! and I am curious as to whether your site is sheltered? or is the structure very heavy and steady? We have only just sorted out our computer to be able to make comments or I would have said hello earlier! Unfortunately I need to say while I am here that the previous comment looks like spam! I haven't tried the link but it just looks not right to me! Sorry to have to say it! Oh and what I really wanted to say......I love your blog! I am happy you said hello, and thank you for your kind comments! We don't get too strong of winds here, but the egg mobile is quite sturdy. Our land is not sheltered, but we are down in a valley of sorts. The hens have been so much happier since we moved them into the egg mobile. I move it every two days, otherwise they dig too deep of dusting holes in one area. Yes, the previous comment was a spammer. He must have slipped through my spam filter some how. Thanks for saying hi and keep in touch!!!! PS. You have a family cow? Yes, we are a family cow family! Your hens look very happy and healthy and I love the way the poo falls through the floor. Our hens perch up on a roost in our barn over the cows stall but every now and again we lose one to a fox during the day as they are so free range. Having the hens follow the cows is a wonderful set-up. Howdy! Could you tell me more about the fencing that is around your new mobile?? Do you have a link to the stuff it is made of? Is there a post on here that I missed where you told about it? I really like it, and it looks like I might need one when we get our chickens going again! The fencing around the area is an electric poultry netting type fence that I bought online through Premier Fencing. It is really easy to move and very effective. This looks great! I love the idea of putting the nests on the outside. May I ask what kind of wood you used and whether you treated it or not to make it weather proof? We used particle board that we had lying around. I will need to paint it this spring with an outdoor paint so it will hold up longer. We bought and used the tin so that it would be light enough to move.